We previously covered the benefits of being customer-focused. That requires insights into your customers’ goals, needs, and problems. The BDA Model is a powerful tool for generating such insights for innovation. Businesses that are customer-focused have several advantages. They’re more profitable (Reiss, 2017) since they can market themselves as a premium alternative thanks to their stellar customer experience. They also enjoy more customer loyalty which in turn can boost profit by up to 95% (Gallo, 2014). 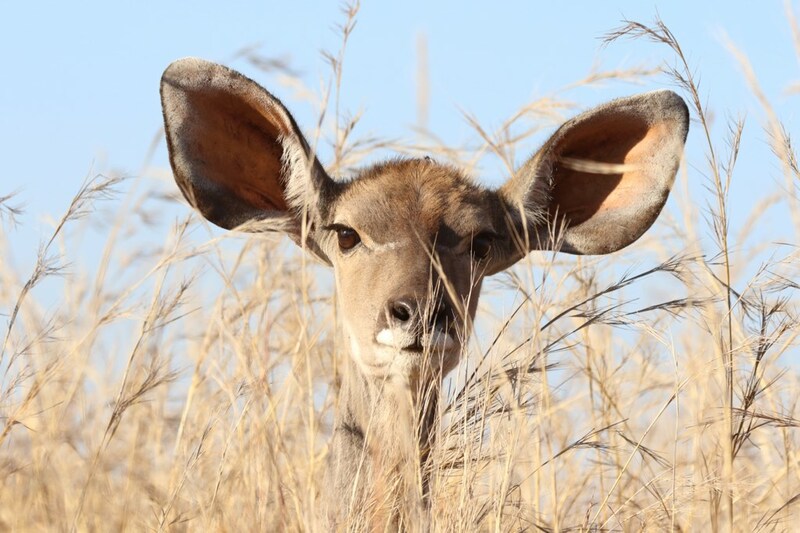 One way to become more customer-focused is to gain valid insights about your customers’ needs before, during and after (BDA) they’ve used your service or product. When doing so, empathy is a key skill. By understanding what “jobs” your customers “hire” your service or product to perform, you can discover new ways to market and develop it. I’ve provided a free worksheet for collecting these insights through client interviews. 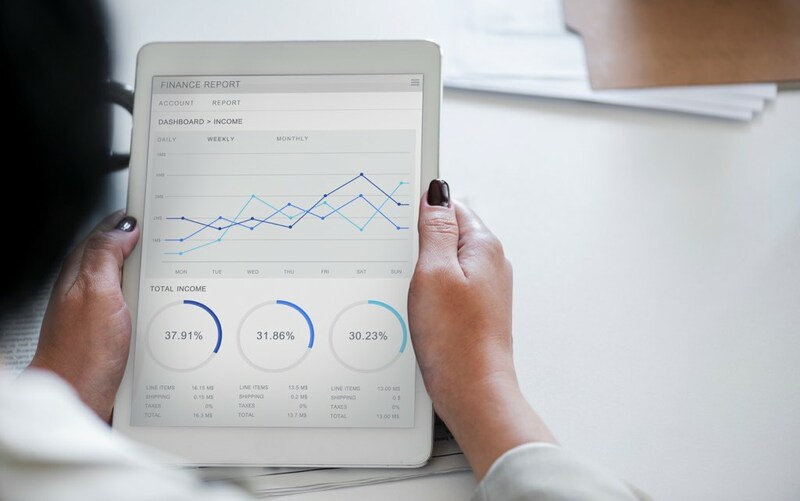 In this post, I’ll introduce ways to analyze the customer experience and provide tools to gain actionable insights. We will focus on what happens before, during and after a client interacts with you. It turns out that most clients don’t value what you deliver as how you provide it. Customers tend to put a high value on consultative services. That includes helping your client diagnose a problem, recommending solutions to them and later supporting your client in implementing them. The value you can provide over time can be visualized using a smiling curve. 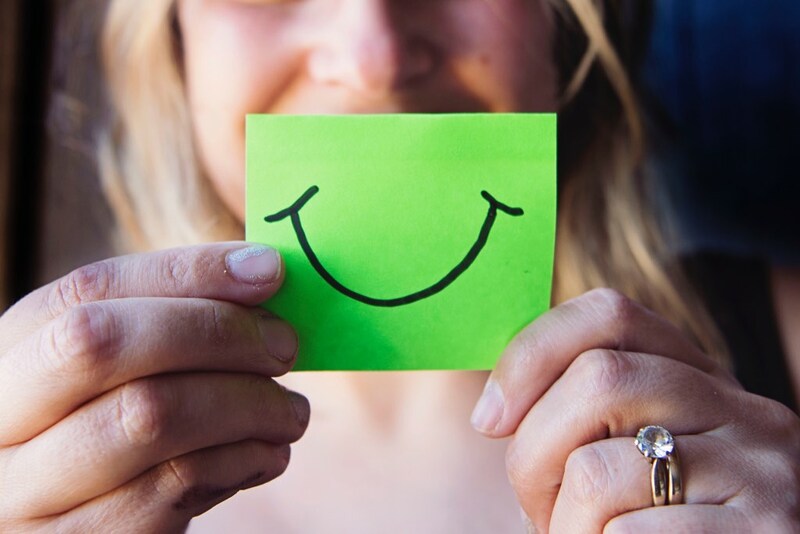 If that sounds interesting, check out our post about the smiling curve for agencies and consultants. 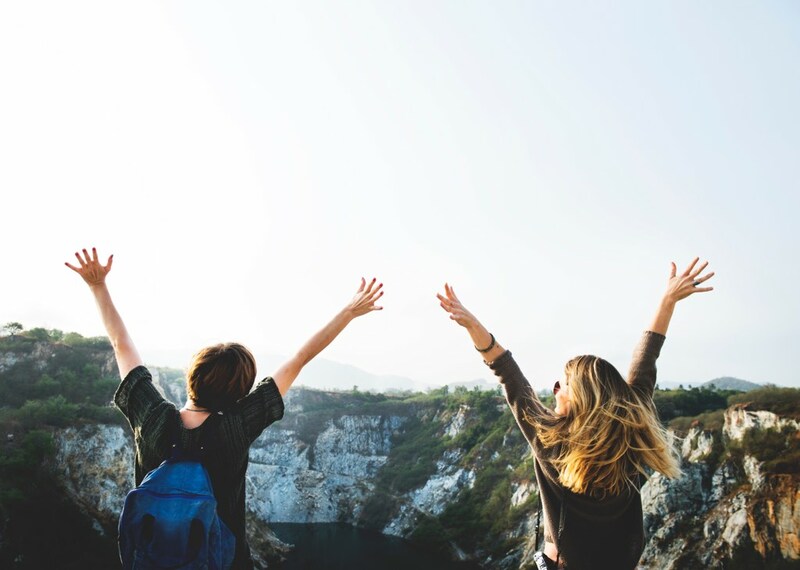 Many of the decisions that successful customer-focused companies have made stem from a genuine interest in their customers. The best way to garner such insights is by using empathy. Empathy is one of the most potent tools to innovate and shape customer experiences. However, it’s an oft-misunderstood term. Some people ridicule it for being “soft” and “wishy–washy” by confusing empathy with sympathy. While sympathy is about feeling with someone and offering them a supporting shoulder, empathy is about seeing and recognizing their perspective, but not necessarily agreeing with it. Empathy is a powerful human ability that designers rely on to create solutions that solve real problems. Modern design disciplines, such as UX and service design, depend heavily on empathy in practice to figure out what people need. The design disciplines are the tools we use in shaping positive and memorable customer experiences. Every time a person uses a service or product it is for a reason and due to previous choices, actions or events. Therefore, designing great customer services requires understanding the context. In other words, what has led to the person turning to the company in the first place. For this reason, we view a service or product as existing on a timeline with prior and subsequent events. Some of these events are under your control and within your purview. Others are outside your influence. We also recognize that events take place in this context and they are linked. To the customer, all these events appear to belong together. 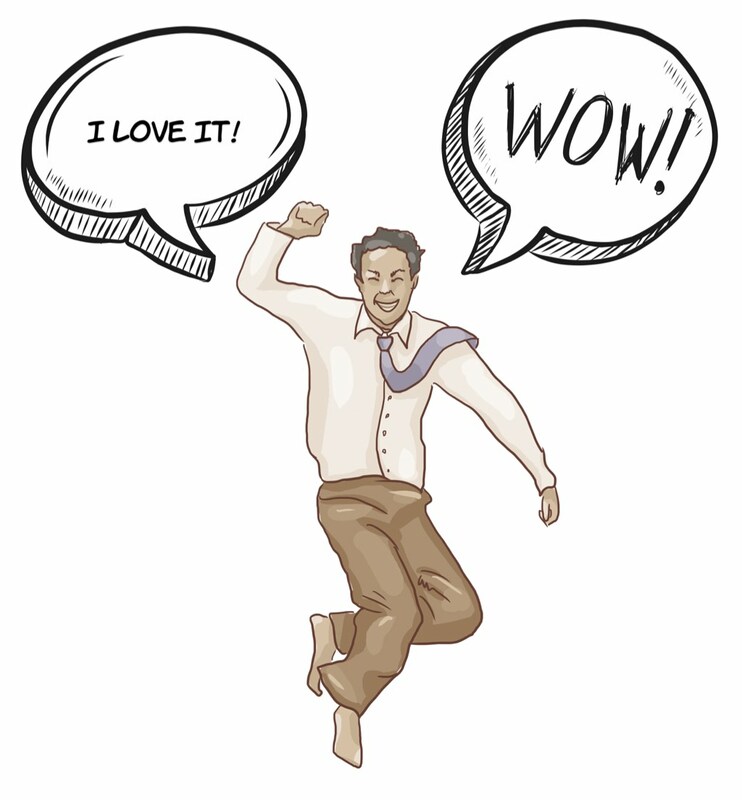 The customer’s perception of how well the company does its job depends on the entire experience. You might think that’s unfair. After all, the company cannot control things outside their scope or purview. I agree with that. However, that’s not how most people think, and more importantly, remember an experience. That is due to these memories being episodic. Episodic memories are connected to people, places, and events and have a distinct beginning and end. We will return to episodic memory in future posts in this series. 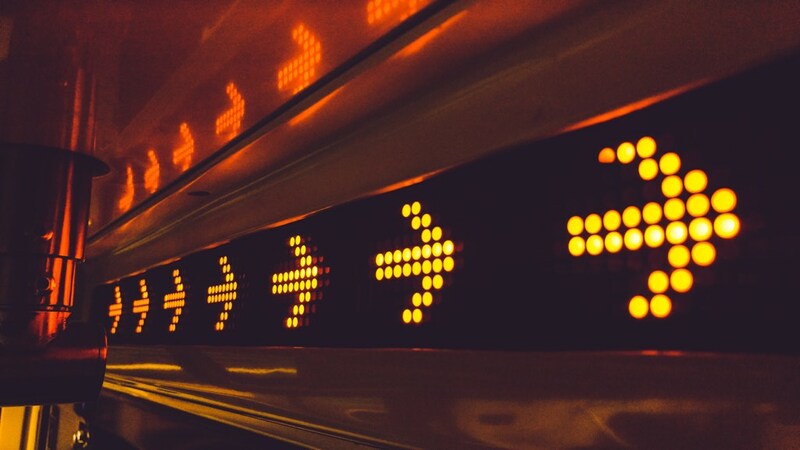 Many agencies that wish to grow diversify along the customer journey. They look at the timeline and see if there’s anything that their customer does before hiring them for which they can provide services. Similarly, they look at what happens afterward and sees if there’s anything there that they can take on. These findings may inspire developing new services, such as building virtual reality solutions for immersive content. However, for any such strategy to work, agencies must take care to also reposition their brand or they won’t be able to sell any of their hard-won new capabilities. With better research, these investments in services and products are more effective and show return faster. Most agencies are usually not highly profitable. They don’t have much cash to spend why investments need to start paying back soon. Asking your clients the right questions helps. You can gain much by better understanding what jobs your clients need done and what services you can provide that perform those jobs. A recent example I heard of was how a Swedish food producer multiplied the turnover of one of their product lines by figuring out what job the products perform for their customers. The food producer put these insights to the test by marketing their line of taco shells and salsas as a healthy (provided you add fresh vegetables) dinner option for “fredagsmys.” A Swedish term which roughly translates to “Friday night cozy time.” It’s a modern cultural phenomenon, which typically involves a family having Friday night dinner together followed by eating snacks and watching animated movies. The food producer’s product line now provided stressed parents with an easy way to feed their kids and enjoy some relaxing time together and peace of mind. Using the same formula, they added more products that performed the same “job.” The result was an increase in product line turnover by multiple factors. If you sell services, this story might seem only vaguely relevant to your work. However, the step from food products to services isn’t as long as you may think. Just like the buyers of taco shells, your potential customers are individuals with jobs (problems) that they need done (solved). What you need to do is to identify those jobs and then market your services as performing those jobs. To do that, you need insights. You can find many insights for growth and identify jobs by mapping the timeline. 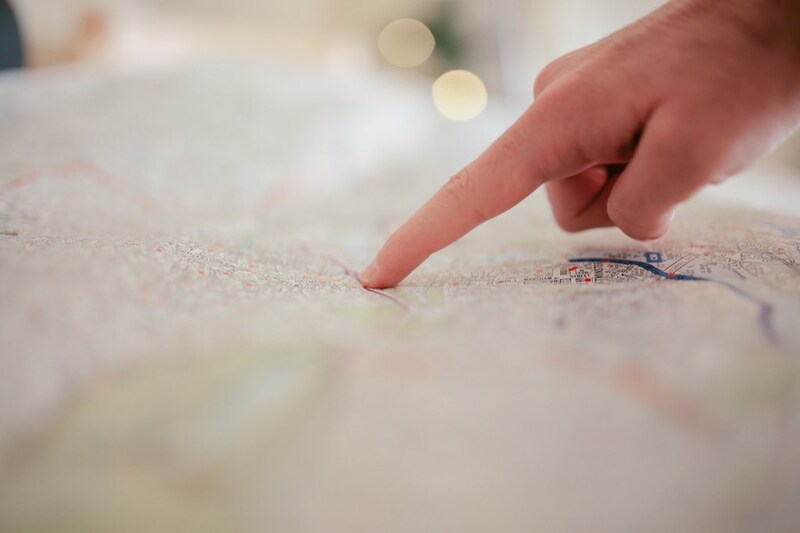 You map the timeline by asking what happens before, during and after the service you provide. Some of you might recognize this as an embryo of a customer journey map and that’s a frequent use for this framework. For our purposes, we do not need to create a customer journey map. However, we will return to customer journey maps here on the Bondsai Blog. If that sounds interesting, sign up for the newsletter to make sure you don’t miss it. Many companies make the mistake of asking leading questions when they interview customers. Instead, try to ask open questions starting with “why?”, “how?” and “what?” and do not label things unless necessary. By that, I mean that you should not let your knowledge or judgment influence how you ask your questions. See the sample questions below for inspiration. An even more in-depth look into interviewing your clients is also on its way, so keep your eyes peeled on this blog. Let’s dig into these three questions and what they can help us uncover and understand. Question 1: What happens before your service or product? Answering this question helps you determine what motivated someone to view your product or service as solving a problem for them. In the case of the wedding venue, the couple was looking for a way to ensure a beautiful and memorable wedding. 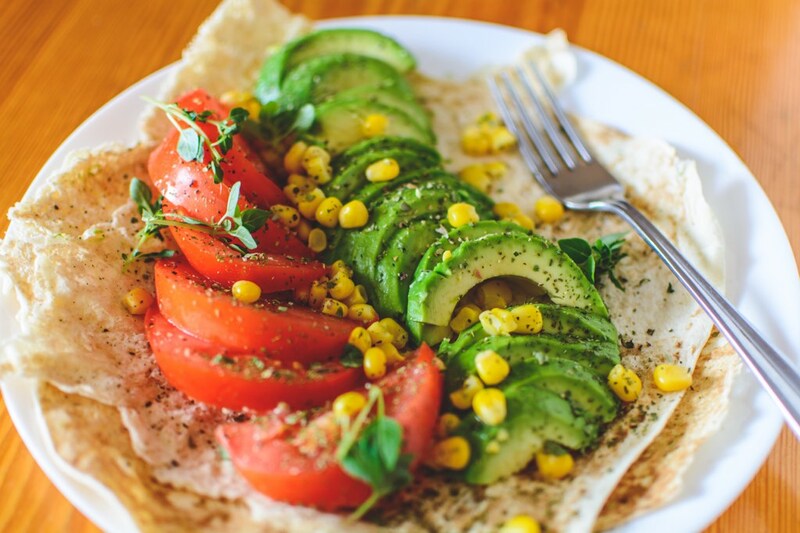 In the case of the tacos, the “before” might consist of a tired father rushing through the supermarket at 5-6 on Friday afternoon trying to find something healthy, and easy to prepare, to feed his family. The more vivid these scenarios are, the more relatable they become. 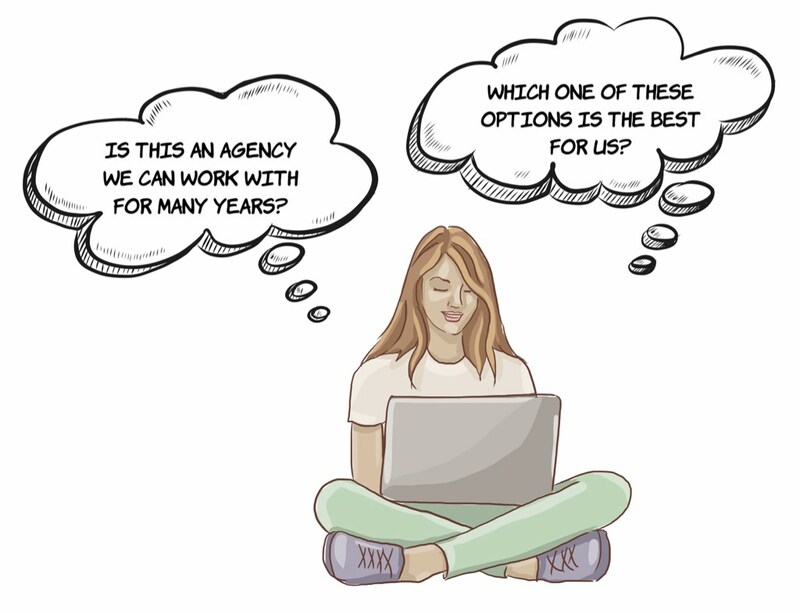 In the case of an agency, clients are likely needing help making the right decisions and prioritizing. They may also seek advice for investing in suitable technology. It’s important to remember that services are credence goods. In other words, the buyer doesn’t know what they’re getting even after the agency has completed its work. This factors in their decision and they will seek ways to mitigate the risk of loss before they buy. Answers to this question may also uncover why someone chose your product or service over another one. What questions do customers have during the Before phase? What are they worried and anxious about? What are they excited about and hope to see and experience? Question 2: What happens during your service or product? Answering this question helps you determine how someone experiences working with you or using something you’ve produced. The “during” phase is what most companies focus on when they think about customer experience. It’s not pointless to do so but what you learn here needs to but put in the context of what’s you have uncovered in the Before phase. You will need to know why customers make certain choices. In the case of the taco dinner, the During phase may focus on how usable the packaging is and whether the instructions are easy to understand. In the case of the agency, much of the effort during this phase is spent keeping clients in the loop. This phase may be about how clear your communication is and whether your client feels in control and comfortable with the information they receive and the perceived progress. What questions do customers have while the company is delivering their product or service (or the customer is using it)? What are they worried about might go wrong with the process? What are they excited about and hope to see? Question 3: What happens after your service or product? Answering this question helps you determine how your client feels after you have completed the majority of the work, whether it met expectations, and performed its job well. The “after” phase might very well be the phase that most businesses consider the least. That’s unwise. Human memory is fallible, and subsequent events will affect how we remember something. You might very well do a fantastic job, but something else didn’t work out afterward, and that will reflect poorly even on your stellar performance. In the wedding couple example, this could be about showing concern and interest even after the venue has been paid. That’s why companies spend time and money sending Christmas cards or gifts to customers, even after project completion and there’s no promise of future business. Customers want to maximize return on investment and getting the most out of what they just bought. As an agency, delivering the app, website or campaign isn’t enough. That isn’t the actual “job.” The real job is the impact of the agency’s work. Smart agencies know this and provide services and support even after they’ve delivered something. At Bondsai, we believe this is a critical part of building lasting customer relationships. 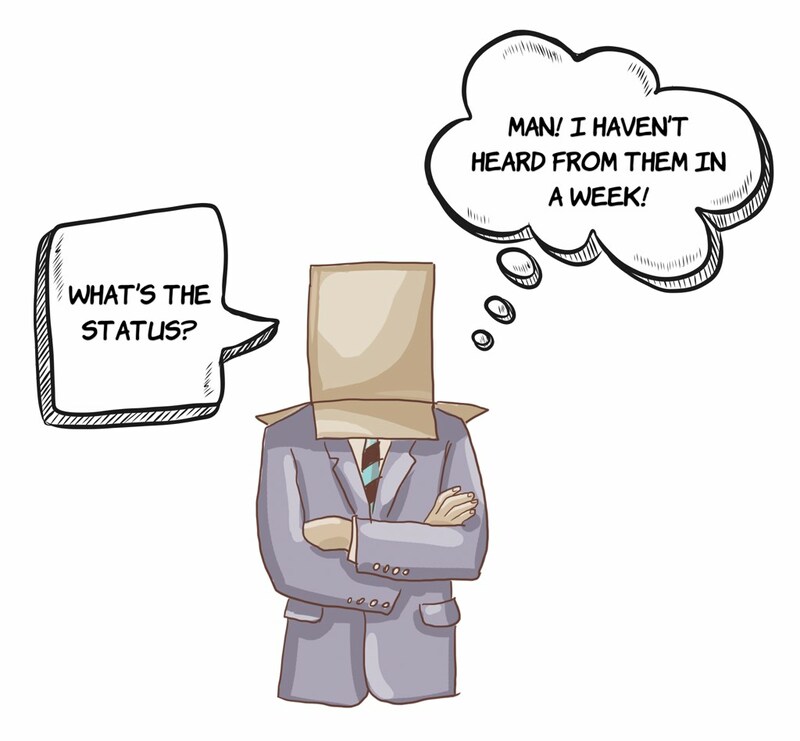 What questions do customers have while in the After phase? What do they expect from you now that you have completed the work? What are they worried might go wrong? What are they excited and hoping to see and experience? Throughout this article, I’ve been repeating one word: insights. These models aren’t useful unless you fill them with real insights. To put these ideas into action, you need to listen to your clients. Find people to interview. Load up your CRM system, Excel sheet, or contacts app and select at least five customers at random. Call them and book a meeting. Book a lunch, or a meeting with each of them. Meet with them, ask questions and listen to what they have to say. 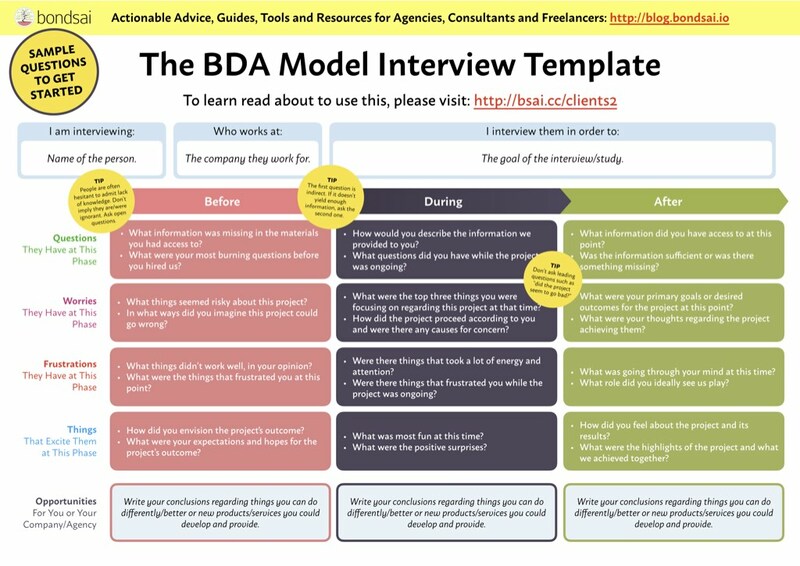 Use the BDA Model Interview Template (see below) and its questions and fields to structure your interviews. By working this way, you can easily compare the results of the interviews. 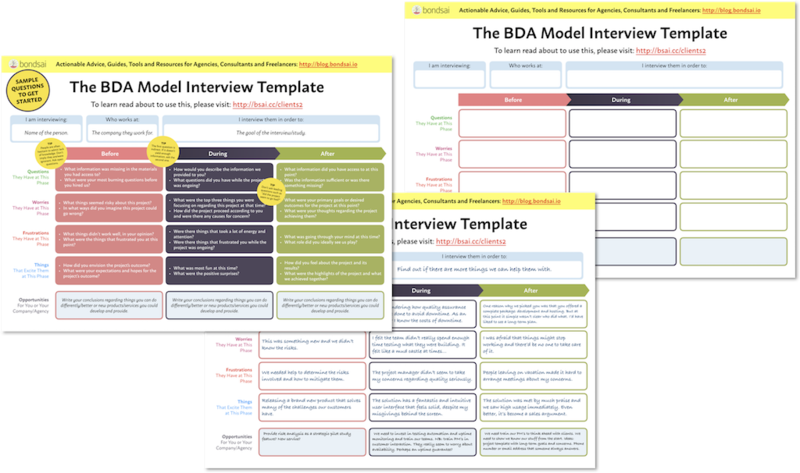 The Before-During-After (BDA) Model Interview Worksheet is a tool that I’ve created to simplify in the collecting of insights from customers. The worksheet is best filled in after an interview using your notes as the sheet is rather large. It offers a birds-eye view of the timeline and makes it easy to draw conclusions and innovate new services and products based on your interview notes. An empty form which you can print out and fill in. Ideally size A3 (Europe) or Tabloid or Ledger (US). Each field has two questions: an open question to start with and a second one which is a bit more leading in case you need to cue the interviewee more. This page shows how the form can be used and uses a fictional and hypothetical interview. 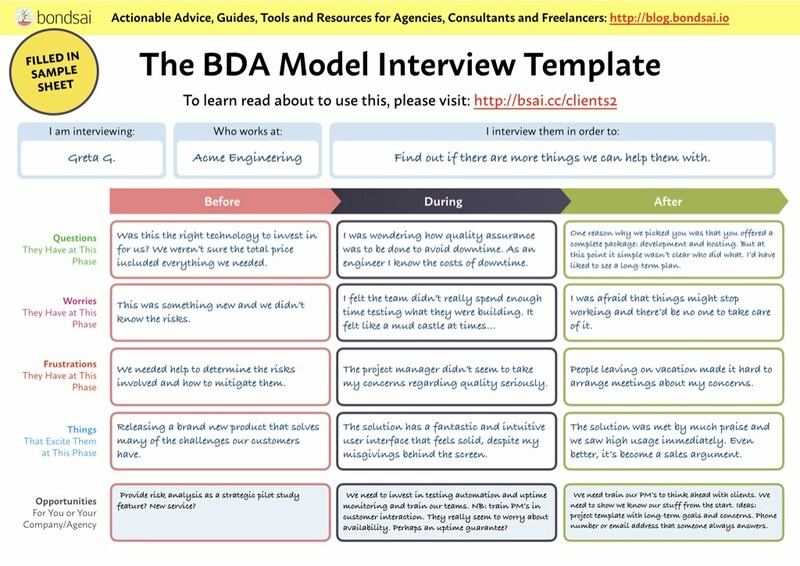 I’d love to hear what you find out using the BDA Model. Please share your findings in the comments or write me an email. I respond to every comment and email I get. In the future post in this series, we’ll look at the role of episodic memories in customer experiences. We will also look at ways to price your services more effectively based on the insights you’ve just made by listening to your clients. The buying of goods and services happens in a context. We can identify unmet needs by mapping that context and understanding what leads up to a decision to buy and what buyer needs it serves. Those needs are best discovered using empathy and customer research and asking open questions. 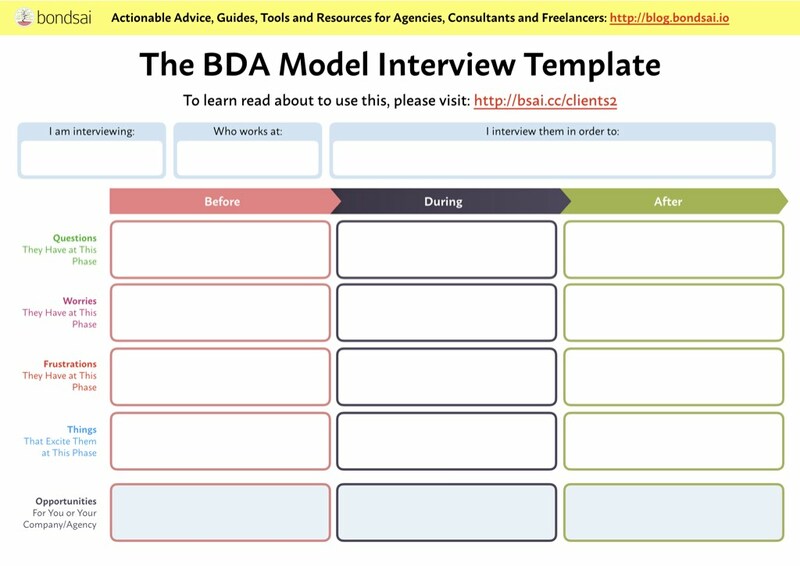 You can use a tool such as the Before-During-After (BDA) Model to simplify this work. The unmet needs can be an inspiration and source for innovating new services and products and improving existing ones. Is talking to your customers using this worksheet something you see yourself doing soon? Download these worksheets for free to carry out structured customer interviews that lead to actionable insights.